Only a handful of restaurants still serve the retro Midwestern meal. In the late 19th and early 20th centuries, East St. Louis, Illinois, was a meatpacking juggernaut. And while cows may not seem like they have much going on upstairs, each animal that went to slaughter had a brain—and each brain made for cheap sandwich filling. To make the concept more palatable, diner cooks across the river in St. Louis, Missouri, breaded and fried the brains, then swaddled them in a bun or some toasted marble rye. They further obscured any offal flavor and appearance with mustard, pickles, and onions. It might sound simple, but cooking brains is easier said than done. For starters, the cook needed to have cold hands, because any warmth would melt the fragile mass as he peeled away the membrane. And when it came to frying, the deep fryer was not an option: Brains responded better to an oil-filled, cast-iron skillet. Although the local slaughterhouses have disappeared and offal is now an uncommon delicacy, a few restaurants in St. Louis and Evansville, Indiana, still serve brains. However, the first diagnosis of Mad Cow Disease in 1986 motivated the switch from bovine to porcine gray matter. According to food journalist Alton Brown, the modern pork version resembles a fritter on a bun. Some suggest the dish’s lasting popularity has to do with the local German population, but the novelty of eating brains attracts curious diners (and clandestine zombies) from all over. Brain sandwiches are available in select restaurants in Missouri and Indiana. 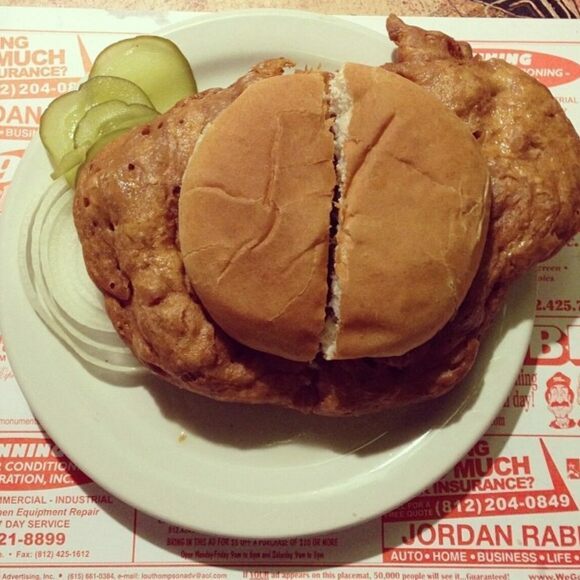 This restaurant is known for its pan-fried pork brain sandwich, served with pickles and onions. This traditional diner serves brains and scrambled eggs with hash browns. Brain sandwiches sold here, as well as other St. Louis favorites like snoot, thin pizza, and toasted ravioli. The St. Louis creation earned the "best use of the worst cheese" award. Satisfy your midnight munchies with this Franken-feast out of St. Louis, Missouri. Don't think too hard about the name. Everything St. Louisans love about this local specialty is in the name. Cow udder is enjoying a resurgence as a sandwich filler in Rotterdam.